Safe Touch Pressure Washing offers commercial and high rise washing services to the greater Jacksonville area. We are fully licensed and insured, and we offer a 100% satisfaction guarantee. We have a wide range of satisfied commercial customers. We have cleaned malls, office buildings, medical facilities, restaurants, warehouses and other facilities. One important common element is that any business enterprise relies partly on its reputation with the public, and appearances count heavily in curb appeal. 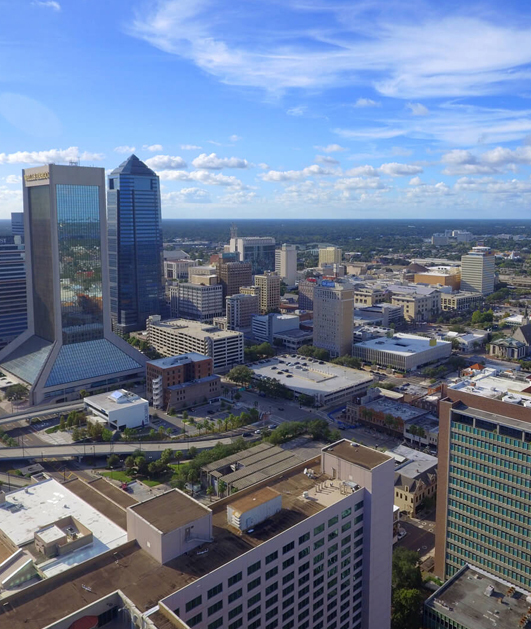 In Jacksonville’s climate, buildings and windows accumulate debris and sometimes mold and algae quickly appear. Parking spaces, walkways and entrances may accumulate oil or grease stains, and sometimes graffiti adds to the problems of appearance. Regular pressure washing fights these chronic problems. Our high rise washing services will prolong the life of paint and windows. Regular cleaning is a cost-effective means of giving your structure fresh look that generates positive curb appeal and with it, customer approval. High rise structures pose special problems. Wind borne debris can accumulate on the top of structures, insects and birds can add to the debris, and pollution in the air and rain can cause stains. Water retained in cracks can create conditions ideal for the growth of mold. An additional factor to be aware of is that personnel who clean the structures can also report problems that are noticed as they work, of the kind that are often not otherwise noticed. Washing is important in keeping a high-rise looking good. High rise buildings generally contain apartments or offices. Obtaining and retaining occupants is facilitated by a clean looking building, very much in the same way that regularly washed commercial structures contribute to curb appeal. Safe Touch Pressure Washing employees are experienced, regularly update their training on equipment and cleaning methods, and are also trained in safety procedures. We offer affordable pressure washing made easy. Request a free quote today!